June | 2014 | That Was an Accident! Previously on “ROY G. BIV Transmog,” our intrepid transmog team had a difference of fashion sense, a dramatic reveal of truth, and a scene in which Prinnie rolled over and admitted Warlock Logic is the Best Logic. Later, Prinnie learned that greedn is good. Ignitine: I want you to picture this brick wall. It’s a very nice brick wall, very tall and thick. Nice, solid bricks, you know, not falling apart or anything. Now, imagine your noggin, and the brain sloshing about in it. You may have more sloshing happening than I do. Next, I want you to picture your skull bashing into the wall repeatedly at high speeds, all this splashing and smashing, until you either break through the wall or have a total bloody meltdown. THAT, my friend, is how I approach things. Prinnie: This explains so much about you. Let’s get this month’s outfit over with, yes? Ignitine: I’m glad you’re starting to see things my way. Prinnie: Oh Gawd help us all, she’s gone back to normal. Ignitine: OM NOM NOM, baby! The moment I first saw this hat, I knew it was a hat responsible for the death of many things – hopes, dreams, and possibly critters. Yes, this hat was clearly a killer, and I had to have it. It worked out (for mostly everyone), though – Wrathie-poo wants the Chimaera of Fear from the Sha of Fear? Yeah sure, I guess I can go grab it for him, ’cause I’m gonna be running Terrace for the hat. 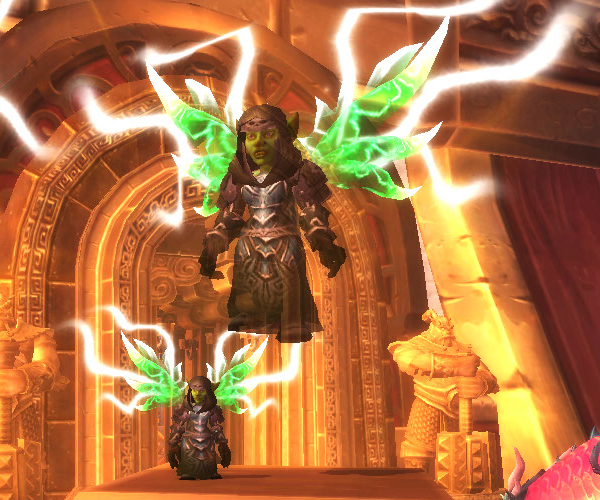 The wings work for warlocks. Since this contest requires you mog all visible slots, it meant she had to save a cloak for mogging purposes. 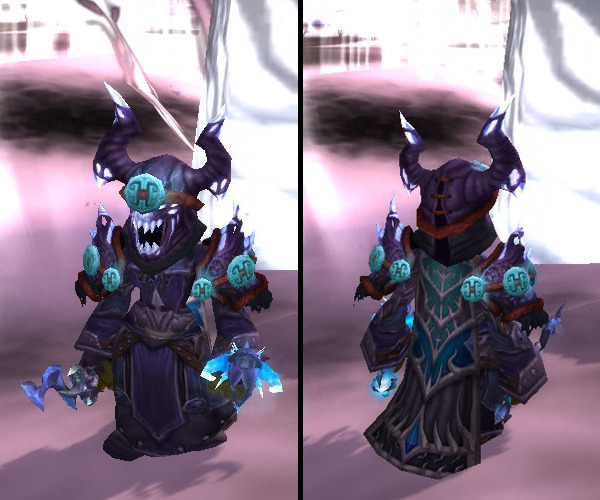 This entry was posted in Cloth, For the Horde, Baby!, Goblins, Ignitine, OMGWTF, Transmog, World of Warcraft and tagged boots of ethereal manipulation, cloth, goblins, hateful gladiator's felweave raiment, ignitine, legendary, legendary questline, midnight sun, mystic's gloves, oh the goblinity, platinum mesh cloak, sash of the wizened wyrm, sha-skin hood, sha-skin shoulders, talisman of kalecgos, transmogging, warlock, world of warcraft on June 9, 2014 by Prinnie Powah.